The Instant Pot makes smooth, creamy grits nearly effortless. You don't have to stand over a hot stove constantly stirring with this method, a real plus when you have other things to do. Just combine the ingredients, put them in the pot, and press the pressure cook button. Top them with some bacon and a poached egg for a hearty breakfast or serve them as a cereal. Grits are also a nice alternative to rice or potatoes. This simple method uses the pot-in-pot method, which makes for easy removal and cleanup. Use a 7-inch to 8-inch heat-proof bowl, soufflé dish, or 3-inch-deep baking pan. Add the grits to a soufflé dish, 7- by-3-inch baking pan, or a similar heat-proof bowl or baking dish. Add 2 cups of cold water, the kosher salt, and 1 cup of milk or half-and-half. Add 3/4 cup of water to the Instant Pot. Place the pan of grits in a baking sling trivet and lower them into the pot. Alternatively, place a trivet in the pot and fashion a baking sling with foil (see the tips below). Lock the lid in place and turn the steam release valve to the sealing position. Choose the pressure cook or manual button and set the time for 30 minutes. When the time is up, wait 10 minutes and then carefully turn the steam release valve to the venting position to release any remaining pressure. Carefully lift the grits out of the pot and whisk until they are well blended. Whisk in the butter, as desired. They will thicken more as they cool. Serve the grits in a bowl along with a big breakfast or serve them as a rice replacement with seafood, meat, or poultry. A baking sling trivet makes it easy to lift bowls and pots out of the pressure cooker. If you don't have a baking sling, it's easy to create one with foil. Tear off a 2-foot sheet of heavy-duty foil and fold the foil in half lengthwise (or thirds if it is an extra-wide roll of foil). Place the pan or bowl in the center of the foil. Place the trivet in the pot and use the ends of the foil to lower the pan into the pot. Fold the ends over the dish so they don't interfere with the seal. When the cooking time is up, grasp the foil ends to lift the pan out of the pot. Extra-Creamy Grits: For extra-creamy texture, increase the water to 2 1/4 cups. Combine the water, milk, and grits in a saucepan and bring them to a boil on the stovetop over medium heat. Cook, stirring, for 2 minutes. Pour them into the baking dish, add the salt, and proceed to step 3. Reduce the pressure cooking time to 25 minutes. 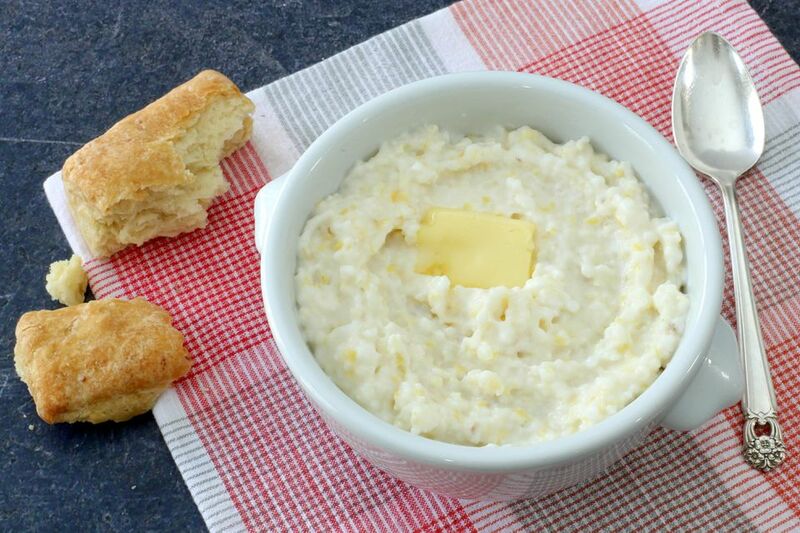 Garlic and Cheese Grits: Add a scant teaspoon of garlic powder to the grits along with the salt. When the grits are done, stir 1 to 1 1/2 cups of sharp cheddar cheese into the grits along with the butter. Southern-style shrimp and grits is another popular way to serve grits.